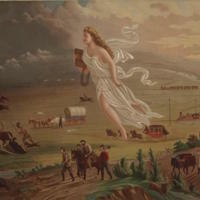 The painting depicts the religious ideology behind United States expansion westward seeing that an angel is guiding the settlers to the west. 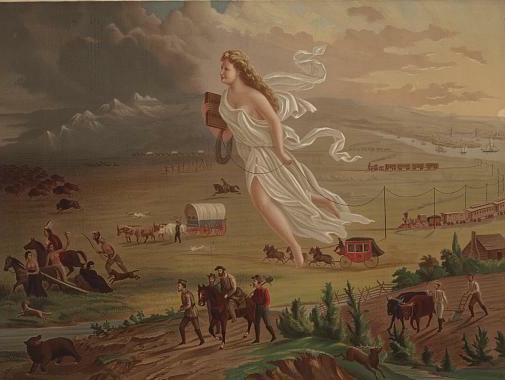 John Gast, American Progress, 1872. Chromolithograph published by George A, Crofutt. Prints and Photographs Division, Library of Congress. George A. Crofutt, “American Progress,” HST 325 - U.S. Foreign Relations to 1914 (MSU), accessed April 19, 2019, http://projects.leadr.msu.edu/usforeignrelations/items/show/76.